A Lunch Full of Magic! 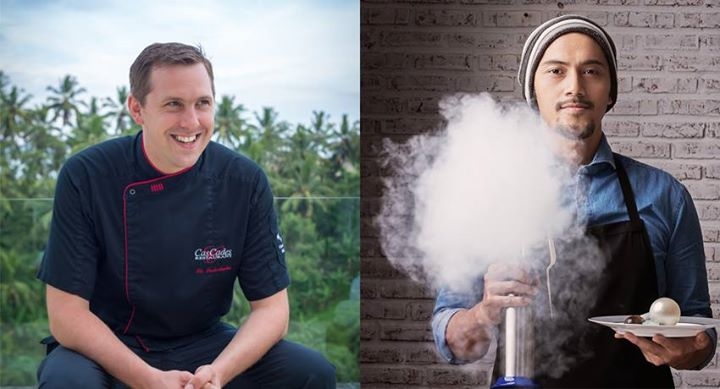 Sunday, 14th May 2017, CasCades Restaurant of Viceroy Bali will present a collaboration between their resident chef Nic Vanderbeeken and #1 Indonesian Molecular Gastronomy Chef Andrian Ishak. The presentation will be bold and the flavours will burst in your mouth like you’ve never tried Indonesian food before! For those wondering exactly what Molecular Gastronomy is, it is a modern cooking technique that adds science to the art, made famous by Heston Blumenthal. Whereas standard kitchens recognise three main components to cooking: the social, artistic and technical; Molecular Gastronomy also involves a limitless imagination and creative skill that few chefs can master. Andrian Ishak is a self-taught chef and owner of Namaaz Jakarta, by all accounts the #1 restaurant in Jakarta. He has pioneered the presentation of Indonesian dishes in a very extraordinary way, whilst maintaining their authenticity to evoke childhood memories of such food. Inspired by a multitude of art disciplines including music and painting, he considers himself as a craftsman that expresses his creativity through food. Working side by side with chef Andrian is CasCades’ executive chef Nic Vanderbeeken, who has more than 16 years of experience working in and establishing restaurants in France, Netherlands, Belgium, Vietnam and now Bali. His experience is what maintains the consistently high standards at CasCades as he leads by example with a strong desire to continue learning new techniques and cuisines. During his time with CasCades Bali he has initiated and collaborate with big names and of Michelin stars restaurants across the globe, like Nick Brill, Benoit Dewitte, Michael Vrijmoed, Shinobu Namae, Julien Royer, Petty Elliot, Thierry Blouet, and many more. *Price is subject to 21 percent tax and service charge. * Wine comes at an extra charge.